U.S. Summer Camps Are Already Hiring! Submit Your Application Soon! If you're interested in working at an American summer camp, but you don't have a job yet, InterExchange can help through our Camp Placement program. We work with international cooperators all over the world who recruit applicants just like you; we then connect you with one of hundreds of camps all over the USA. There are a variety of different camp jobs available. Start the application process today. Summer camp jobs can be hard work, but you'll be compensated well for your efforts. InterExchange guarantees a competitive pay rate for participants in our Camp Placement program. Stipend amounts vary based on the type of camp jobs, as well as age levels. Your stipend may not look like much, but with room and board included, it's money in the bank! If you already have a job and are participating in our Self Placement program, then you'll negotiate your stipend directly with your camp. If you are a counselor and do not buy your own plane ticket, your stipend will be $900 (age 18), $1,000 (age 19-20) or $1100 (21 and over). These stipends are all based on a 9-week (63-day) schedule. If your placement lasts longer, you'll be paid an additional $30 for each additional day you work. And remember, your camp will also provide you with free housing and meals. Your adventure doesn't have to end when the camp season is over. One of the great advantages of InterExchange Camp USA is that it gives you the opportunity to travel anywhere in the U.S. for up to 30 days after you finish working at camp. 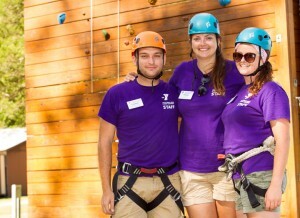 Because you'll meet many other young adults who are working camp jobs over the summer, you're likely to make friends who can travel with you. And since you've already been in the U.S. for several months, you'll have improved English skills and a better understanding of American culture, which will make it easier for you to travel. Plus, you'll have the money you earned at camp to help pay for your travel. InterExchange staff will still be available to provide support and assistance if you need us during your travel period. If you ever have questions or problems, we're always here to help. If you're looking for more travel resources, check out the Cultural Compass, our guide to exploring the USA!